I was looking for an age appropriate and comfortable costume idea for my 17 month old twins. 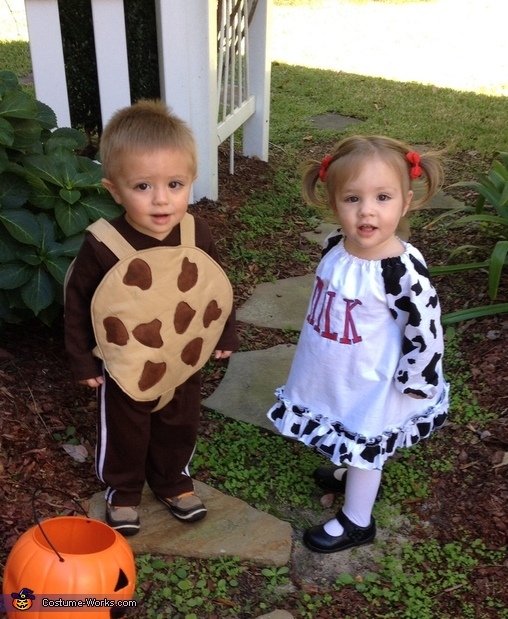 I came across this idea of cookies and milk from an internet search and decided with a couple yards of fabric and scraps I have in my stash I could make a couple of cute costumes that can be worn all day if needed. I made a simple long sleeved peasant dress with 1/2 yard of cow print fabric and 2/3 yard of white fabric and paired it with white tights and black shoes for my little girl. I used the lid of a Home Depot bucket for the cookie shape and used 1 yard of tan fabric to make a sandwich costume, the chips are from brown fabric scraps and the two cookie sides are velcroed. I put my little man in a brown track suit and brown shoes.